Lansing Linde Ltd is a subsidiary of the world leading German based Linde Group, who are the largest manufacturer of materials handling equipment in the world. The ultra modern Basingstoke factory produces a range of electric counterbalance, reach trucks and tow tractors of which over 80% is exported to all the key global markets. Forklifts are supplied for an extremely wide variety of applications, many of which have specialised needs. Identifying the optimum handling solution for individual client need is therefore a key element in Lansing Linde’s evaluation and proposal process. 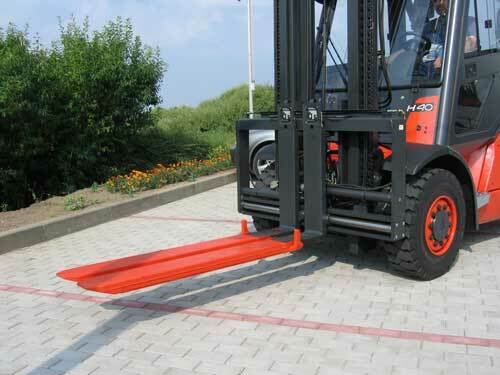 KOOI-REACHFORKS® forks have been used by Lansing Linde since 1991, primarily on reach trucks. So what benefits do KOOI-REACHFORKS ® offer, and how do these relate to the application assessment process. There is a legal test requirement for equipment used for double deep applications under an EC Directive and Lansing also required their chosen suppliers to have the appropriate ISO standards. Meijer Handling Solutions, were the first to use two cylinders in each of the forks. The in-built flow control valves ensures that the forks remain in line with each other, which is important when handling various pallet weights, lifting at height, or reaching across a vehicle. These factors, coupled with the results we had obtained from a range of test criteria, enabled us to be sure that the telescopic forks provided the best possible engineering solution for many applications,” he continued. Meijer Handling Solutions has a world wide service support network this enables us to provide maximum support for clients, wherever they are located. Their UK representative, Abbey Attachments Ltd, technical expertise, service and advice has been well demonstrated. Clients’ needs vary considerably from one industry sector to another. Those within the pharmaceutical and chemical sectors have differing criteria’s compared to those within the food and beverage industries for example. “The nature of our clients’ respective businesses within the pharmaceutical, defence, chemical and hazardous product sectors require that the trucks, like the telescopic forks, meet a range of criteria’s specifically relevant to them. Besides hygiene, and health and safety issues, we have to supply products that are suitable for these specific environments,” Sullivan added. “Our clients also include those within the third party logistics sector, many of whom operate large central distribution centres, primarily on behalf of many of the world’s leading brand producers,” responded Sullivan. “Others include those within the national newspaper industry. All of their requirements and expectations, not only for the trucks but also the attachments are equally demanding. Operating 24 hours a day, 7 days a week, throughput time is invariably critical”. Lansing Linde have over 50 years experience in the design and manufacturing of fork lift trucks, during which time they have earned an enviable reputation. “We are totally ‘market driven’ and innovative, technically excellent products which help us to often exceed our customers’ expectations are an important element of our success. Which is why we select our long term attachment supplier partners, such as Meijer Handling Solutions very carefully.” concludes Sullivan.